The small band is made up of a maracas, bongo, saxophone and guitar player with a lead singer taking centre stage. Their cute and carefree faces are loveable placed indoors or out. Position them on top of a low wall or wooden bench to brighten up a tired garden. Alternatively, congregate these five musical wonders on a shelf in the dining room and watch them bring joy to anyone who sets eyes on them. Although not obligatory, we recommend the use of fixing rings welded to the feet of the sculpture and ground spikes to increase the stability of the product when placed on various surfaces outdoors. This sculpture can be placed outside but will need relacquering over time to maintain a high-quality finish. Other finishes are available upon request. Frogs are delightful creatures and their appeal has been taken a step further by turning them in to a quirky musical band. 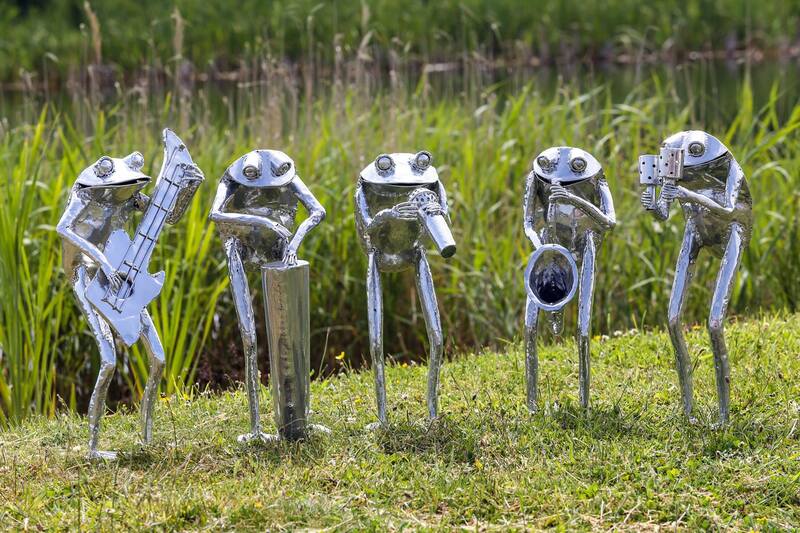 Each frog has a different instrument and they would be a fun and whimsical touch to any garden or home as individual pieces, in duets, trios or as the full group. Small frogs would make a great fireside feature singly or as a group and are available with microphone, saxophone, maracas, bongos or guitar. They would also look splendid grouped at the base of a tree, alongside a greenhouse or dotted around the garden. Larger version available. Be the first to review “SMALL FROG BAND” Click here to cancel reply.